Intro: Various symbolic beliefs have been preserved and continue to this day among the Doukhobors. In some cases the origins of these practices are no longer relevant, and in others, are not even known by today's practitioners. 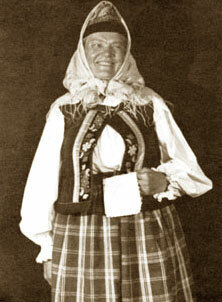 One of these is the significance of the handkerchief as part of the traditional Doukhobor women's costume. There have been various inquiries lately about the origin of the handkerchiefs Doukhobor women hold when in traditional costume. Aside from functional use of absorbing sniffles or wiping away tears, these handkerchiefs are often examples of ornate handiwork and design, and clearly, are not simply functional. In essence, they have come to embody symbolic significance within the general accouterments. Although the Doukhobors ostensibly rejected symbolism and ritualistic practice as empty rhetoric of the Orthodox Church, they retained ritual and symbolism of their own dating back many generations, so much so that even contemporary Doukhobors carry out some of these behavioral tactics with no viable connection or understanding of their origin. The following conclusions about the origin of the hanky is based on research and conversations that I have had with Doukhobor elders in Calgary and in Russia. The origin of the symbolism of the Doukhobor handkerchief seems to find a parallel to the time of the Jews fleeing Pharaoh in historic Egypt. To sustain themselves on their monumental journey (pout) the Jewish women hastily prepared bundles of unleavened bread to sustain them on their journey out of Egypt. This ritual bag of sustenance is noted to this day in the Jewish Seder and the unleavened bread is still eaten on that high holiday to commemorate their historic flight. Early Doukhobors were very familiar with the Israelite story of emancipation. Psalm 69 in the Book of Life is essentially a rewrite of the Commandments in Chapter 20 in the book of Exodus. Psalm 189 contains the themes in Exodus Chapters 13 to 17. This indicates an early familiarity with the story of the flight. It is a natural conclusion that the story of the Israelite's deliverance in Exodus in the Bible connected sympathetically with the Doukhobors who related to the history of displacement and exile. It is logical to assume that this became the inspiration for the female elders to have such a survival hanky prepared for a quick move. It would contain the dried bread [soukherii], hard sugar if it was available, and tea, mostly home grown organic. In case of an enforced quick move they were prepared with nourishment for at least a limited time. I have known of Doukhobors as recent as the days of settlement in B C who had such preparatory bags near by, and on one occasion, due to a false alarm, these bags were gathered and a trek began out of some of the communal villages, until they realized it was not necessary. This was recounted to me by a Doukhobor elder some time past and occurred in the early years of communal settlement in B.C. Other elders were prepared for departure at a moment's notice as they believed that their move, either back to Russia or another destination was imminent. There was no shortage of hanky material, this would be comprised of linen remnants from larger pieces and in early days were not custom made as handkerchiefs. Eventually, through permanent settlement with the threat of enforced move removed, these preparations for the 'pout' (journey), were no longer necessary, and gradually, the hankies no longer contained anything but continued to serve a symbolic value, accompanying the female costume, and signifying that flight was possible if necessary. As this occurred, the handkerchiefs took on a more decorative function and embroidery and fringe crochet and designs etc. were added. Today's practitioners may not know the origin of this adornment, but include the hanky as an integral part of the costume. This is only one example of many which at one time arose out of necessity, but have now lost their significance and meaning to the contemporary generation, although the outward form is still preserved in ritual. 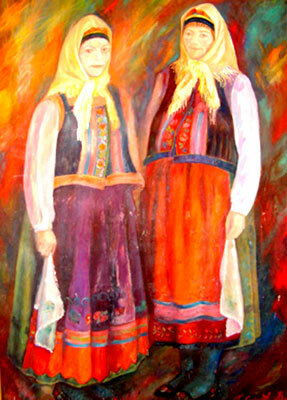 Doukhobor Ladies by Russian Doukhobor artist Volodya Gubanov.